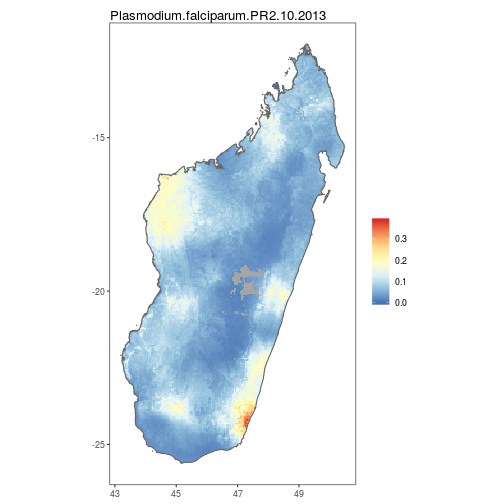 An R interface to open-access malaria data, hosted by the Malaria Atlas Project. 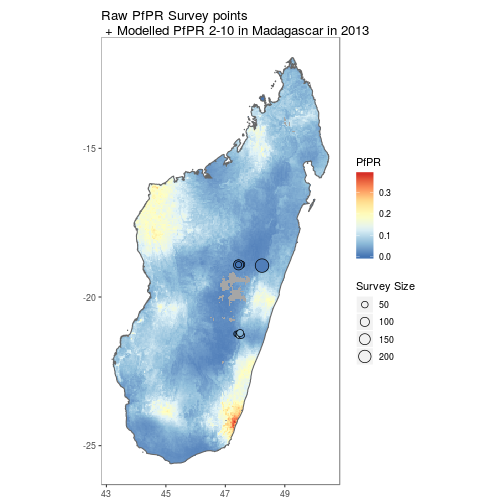 This package allows you to download parasite rate data (Plasmodium falciparum and P. vivax), suvery occurrence data of the 41 dominant malaria vector species, and modelled raster outputs from the Malaria Atlas Project. More details and example analyses can be found in the published paper. The data can be explored at https://map.ox.ac.uk/explorer/#/explorer. listData() retrieves a list of available data to download. listData(datatype = “pr points”) OR listPoints(sourcedata = “pr points”) to see for which countries PR survey point data can be downloaded. listData(datatype = “vector points”) OR listPoints(sourcedata = “vector points”) to see for which countries Vector survey data can be downloaded. use listData(datatype = “rasters”) OR listRaster() to see rasters available to download. use listData(datatype = “shape”) OR listShp() to see shapefiles available to download. isAvailable_pr confirms whether or not PR survey point data is available to download for a specified country. 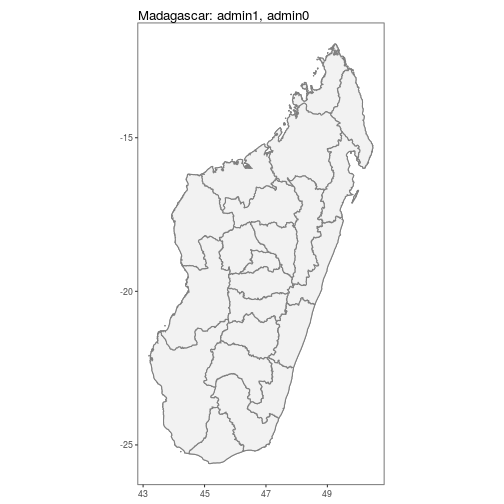 ## PR points are available for Madagascar. ## Data not found for 'USA', did you mean UGA OR SAU? isAvailable_vec confirms whether or not vector survey point data is available to download for a specified country. ## Vector points are available for Myanmar. autoplot.pr.points configures autoplot method to enable quick mapping of the locations of downloaded PR points. A version without facetting is also available. autoplot.vector.points configures autoplot method to enable quick mapping of the locations of downloaded vector points. N.B. Facet-wrapped option is also available for species stratification. getShp() downloads a shapefile for a specified country (or countries) and returns this as either a spatialPolygon or data.frame object. ## Source: "C:\Users\whgu0734\AppData\Local\Temp\RtmpkhqjpA/shp/shp1a64711977c4/mapadmin_0_2018.shp", layer: "mapadmin_0_2018"
## Source: "C:\Users\whgu0734\AppData\Local\Temp\RtmpkhqjpA/shp/shp1a6412ff2b1c/mapadmin_1_2018.shp", layer: "mapadmin_1_2018"
autoplot.MAPshp configures autoplot method to enable quick mapping of downloaded shapefiles. N.B. to use downloaded rasters and shapefiles directly with autoplot, use as.MAPraster() and as.MAPshp() to convert these to data.frames. Alternatively autoplot_MAPraster() will work directly with RasterLayer, RasterStack or RasterBrick objects downloaded with getRaster(). autoplot.MAPraster&autoplot_MAPrasterconfigures autoplot method to enable quick mapping of downloaded rasters. By using the above tools along with ggplot, simple comparison figures can be easily produced.